Large - €47.99 Only 3 left! X-Large - €47.99 Only 1 left! Cinderella never gets her due, does she? Well, yeah, she does at the end of the movie, obviously. What kind of fairy tale would it be if that didn't happen? But before that, she gets pretty terribly treated by her supposed "sisters". Instead of being nice to her they just make her cook and clean. And you think, "Okay, well that's not very nice but it can't be that bad. I have to cook and clean too." But on top of all of that they also take every opportunity to look down on her and make her life miserable. Who tears apart someone's dress that's been made by birds and mice? That kind of gown would sell for a bundle on Etsy! What jerks, taking sibling rivalry to a whole new level. They are not good sisters at all. Thank goodness for fairy godmothers, right? So finally, Cinderella's fairy godmother shows up to get her to the ball so she can meet the prince and fall in love yada yada and all that, but if we were Cinderella, after just a couple minutes we'd be like "Uh, hey fairy godmother, I've been living with these monster women for like half my life. Couldn't you have shown up just a little bit sooner?" It's a fair point. Fairy godmothers have no sense of timing. Good ol' Cindy understood though, the important part was that her Godmother got there in time. The lesson here? Be like Cinderella. She's a class act. This tea length gown will be perfect for twirling around that long-awaited ballroom. Its icy blue fabric falls in layers on the skirt. The bodice is fitted and framed with a filmy neckline and sleeves. Butterflies dot the neckline as if put there by a magical spell. 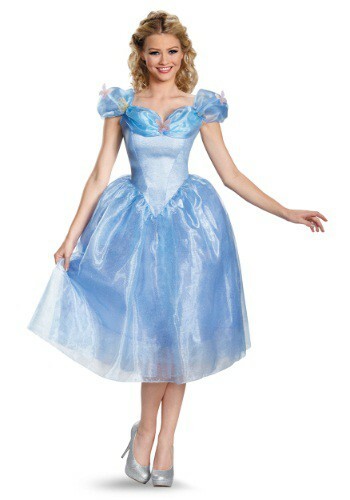 Hey, even if this dress will turn to rags at midnight, it's fit for a princess!